Crafted from 100% solid, sustainable American Cherry heartwood, simplysitting's 'sweet seat' is an evolutionary leap in design. Unlike rigid, flat, two-legged benches, the seat is self-centering and curved for comfort. The revolutionary, patented, pedestal leg is so stable and perfectly balanced it will stand on its own. The seat promotes perfect posture and allows for full, expansive breathing as it supports you weightlessly. Its ingenious design allows you to roll gently in all directions and out of any discomfort. The ultra lightweight package breaks down in one swift, snappy magnetic motion. Smaller and lighter than a notebook, the seat easily slips into your bag or backpack. 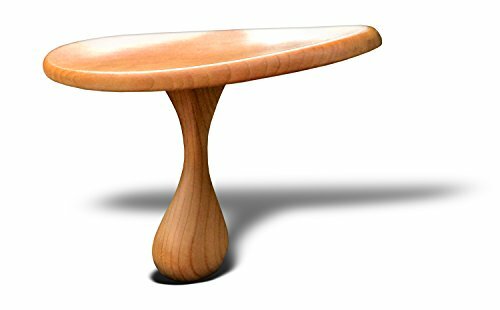 Beginners, longtime meditators, yogis, doctors and holistic practitioners find the sweet seat provides an elegant and simple solution to poor posture, restricted breathing, slouching and knee, back and ankle pain. It also eliminates the need to buy, store, transport or clean bulky mats and cushions. And if you are looking for some extra motivation for your meditation, this cherry keepsake makes an irresistible invitation to daily practice! All items are handcrafted by lifelong woodworkers in the Pennsylvania Wilds and guaranteed so you can own a piece of American craftsmanship that will last a lifetime. Our revolutionary, patented meditation "sweet seat". Lightweight- breaks down and reassembles in one swift magnetic motion. Patented design promotes perfect posture, balance, and breathing. Portable- just store it and go! Handcrafted in sustainable American cherry heartwood and curved for comfort. If you have any questions about this product by simplysitting, contact us by completing and submitting the form below. If you are looking for a specif part number, please include it with your message.